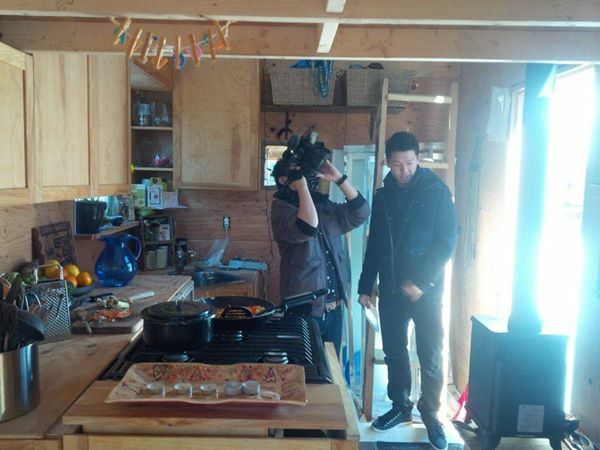 Today, Spencer Gall of Fairchild TV came by as part of their Micro-Home Documentary coming out in April, and I actually remembered to get a pic of them doing their thing. After over a dozen interviews and half a dozen on-camera interviews in the last year, Jack's got a long list of things to do to get ready! - Sweep, and remove dead flies from window sills. - Accept that my bathroom will be criticized. Again. - Accept that everything about everything will be criticized. Again. - Wash face. This is actually something I have to write down! - Put away the mink skin. It's a bit hick. - Be real, authentic, and true. 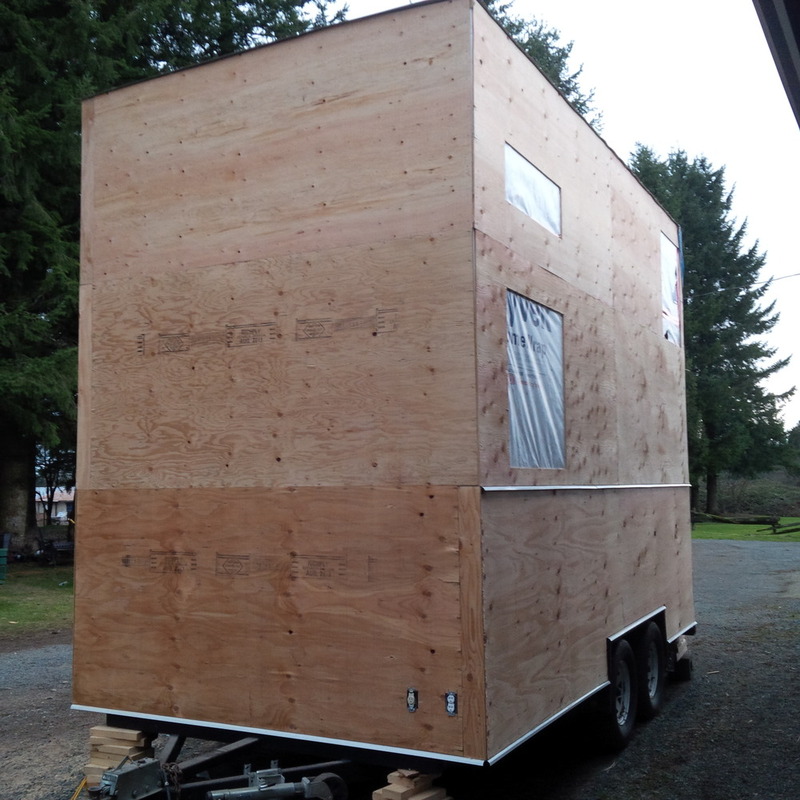 Media Craziness: How Much Exposure Can Your Tiny Home Handle? 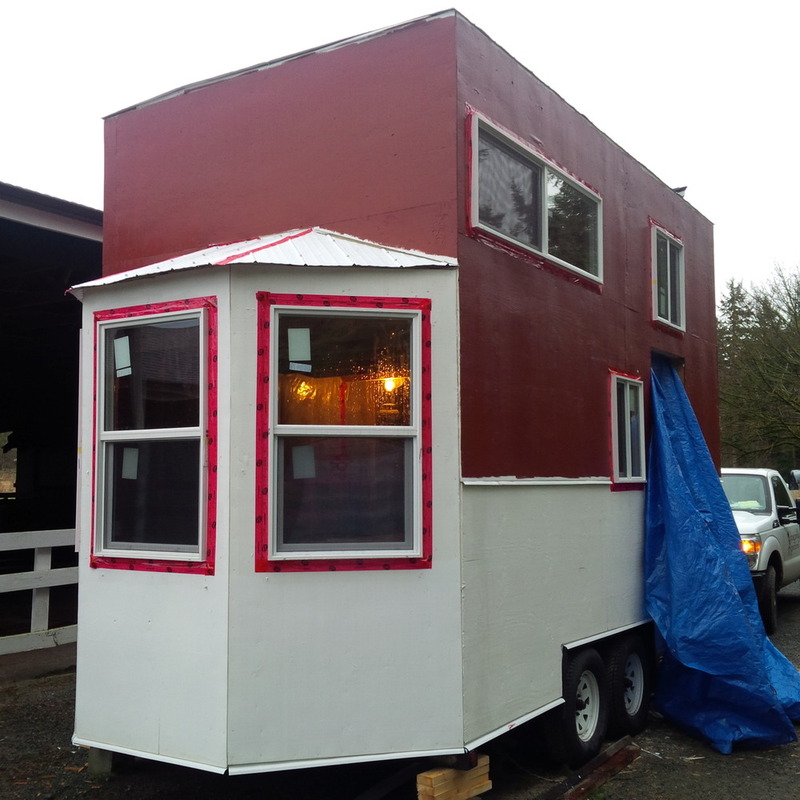 I've been getting emails and messages from others who own Tiny Homes about how to deal with media curiosity. Sometimes I feel like I'm a novelty show in the era of "bigger is better", and sometimes I ask myself how many more interviewers and photographers I will let into my personal life and space. I get it--they want to understand what it is that sparks inside people to cause them to suddenly say "No" to the "desirable" societal norms where we can go as big, as fast, and as far as possible. How much do we say? How much do we want the entire Internet seeing, knowing, and critiquing for years to come? Will it end your privacy? Open your life to scrutiny and invasion? Put you in the spotlight of the powers that be? There is always more than one way of looking at it--potentially negative or potentially positive. I say potentially, because this is your home, and this is your life--make it what you want. 1. "No comment." Make friends with this phrase--it's not rude in media circles, it says "respect my space." You can choose what you want them to know, and you have every right to state your boundaries and have them respected. 2. You'll survive the whole process. If you want your privacy back, simply disappear from view. It helps to identify what your goals are in receiving exposure, and speak to those ends. Your life purposes and goals are your own. If you want to impact change, inspire or educate people, poke holes in how life "should be", exposure can help you--but identify your goals and establish your boundaries of privacy. You can choose to fall back into obscurity at any point, as exemplified by many celebrities who spent years in the spotlight. 3. But, don't read the comments. Seriously. Understand that anonymous people living on their couches live to criticize, and they all know how to do it better than you did it, and they'd change probably everything you did to do it better, faster, cheaper, and more efficiently. 4. Make it work for you. If you're nervous about by-laws and zoning regulations, you can either live in fear and tread softly, or you can choose to be on the forefront of change. Communities all have Official Community Plans--when your OCP comes up for discussion, show up. Speak about the advantages municipalities and Tiny Home owners would experience through change. Living in guilt or shame or hiding causes people to believe that you are guilty, so live with head held high, and people will start to shift their thinking. But be patient. It takes time.... sometimes, a lot of time. Check out our other FAQ here! Jack in a Box is on Facebook! 200 likes overnight, and almost 300 in a week! Join us here for continued building pics (that's right, it's not done yet, so y'alls just holds yer horses). 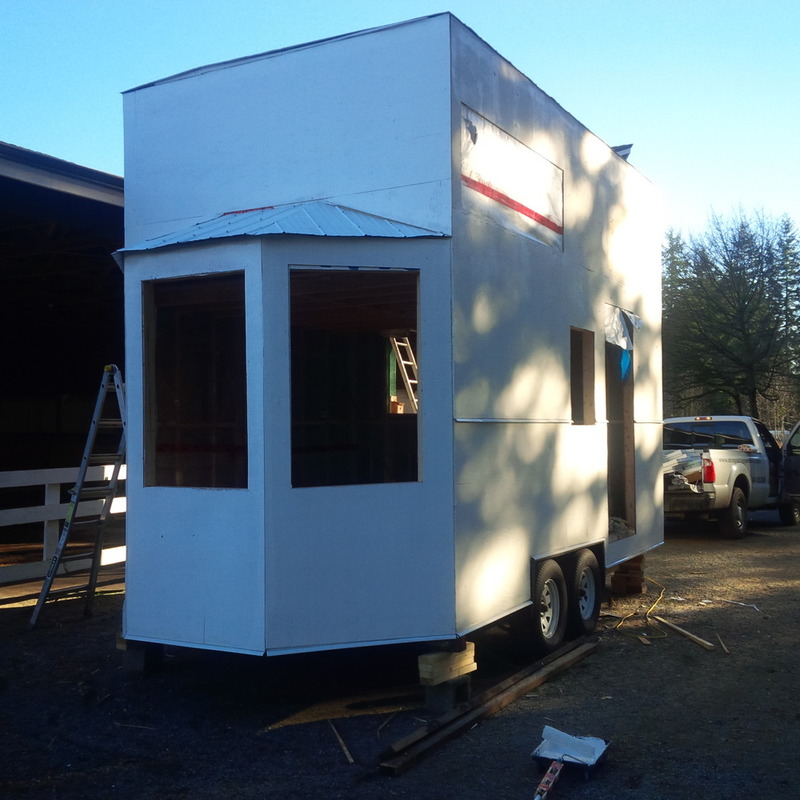 I'll be taking a break for a bit on the building as I develop an app that will walk wanna-be-tiny-home-owners through the legalities, restrictions, weight and height explanations, design process, and build process. When the app is ready to go, I'll be plugging it here, and posting it on the FB page as well. And yes, it'll be an Apple app, cuz Apple's apps are easy to make! So apologies if you don't own or have access to an Apple product, but maybe there's a BB or Android geek out there who will join the cause! Refinancing? Mortgages? Loans? No thanks, I own my home, and it cost me $15,000. No, we don't. We rent. Who can afford real estate here?!" And many variations thereof. Some people went out of their way to avoid her. As I walked by her, hearing her continuing to ask the same question to everyone, the skip in my step wanted to grow wings and turn into a bust-a-move-pixie-faerie-genie-dust-firework show. YES! I own my own home!! And I don't have a mortgage. I didn't win the lottery. No, no crazy rich family member. And yes, I'm single, female, and financially independent. And I don't owe anyone a penny for my home. Yes, I own my home! So 'scuse me while I dance my way out of every financial institution that exists, every mortgage broker's office, and every real estate predicament! 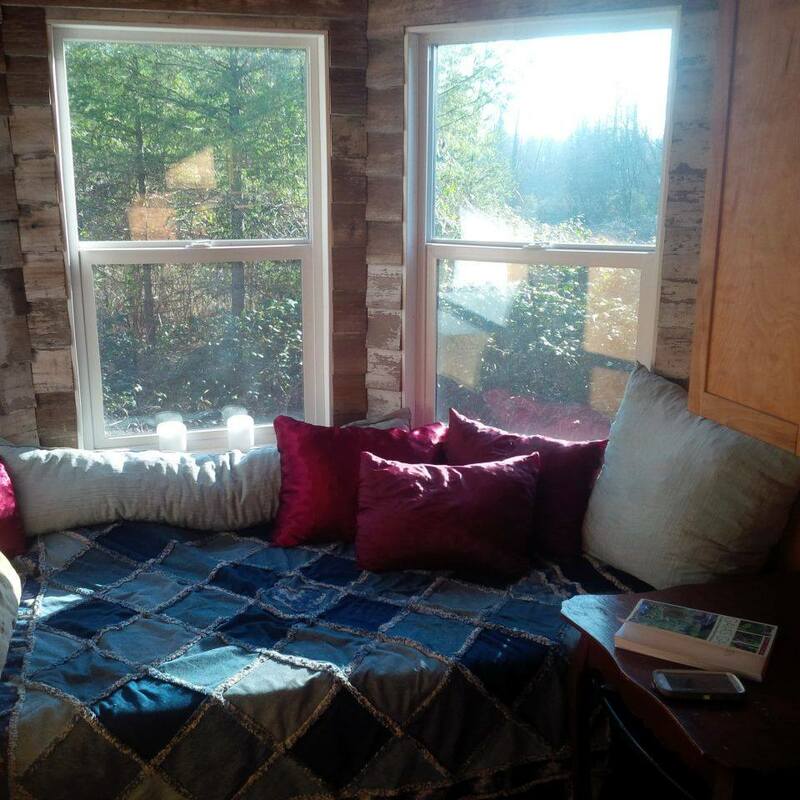 $15,000, a home custom-designed by me to fit me, a life free from soul-sucking payments, the ability to travel and do things now instead of when I'm 70.... Now, I'm not sure why I didn't do this sooner! 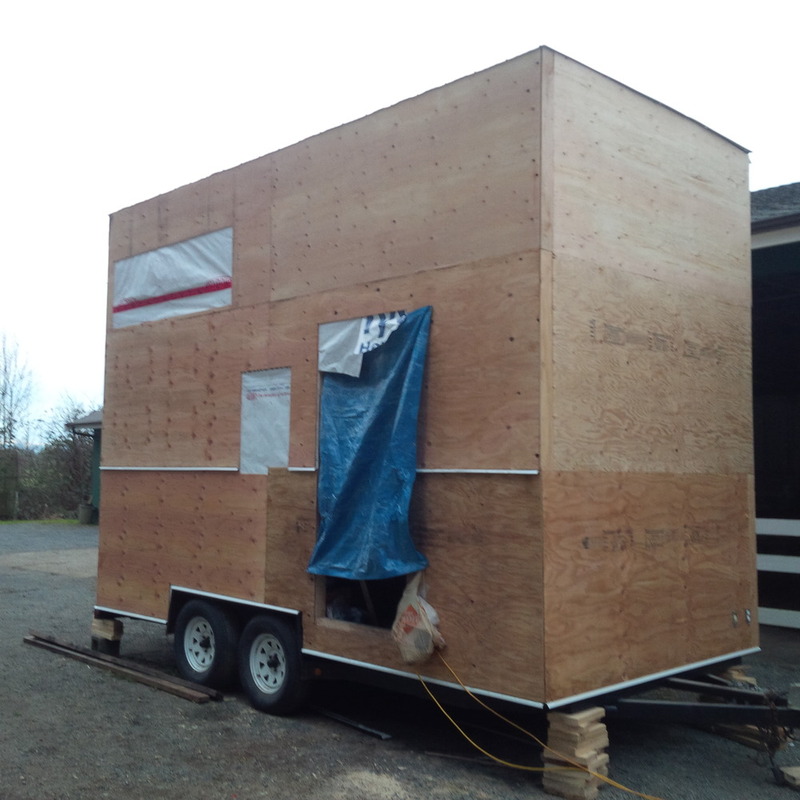 Hey, uni students.... instead of using that grant for rent, use it to purchase a movable home that can go with you anywhere, and that will turn into rental income for you later. Seriously. Call me. 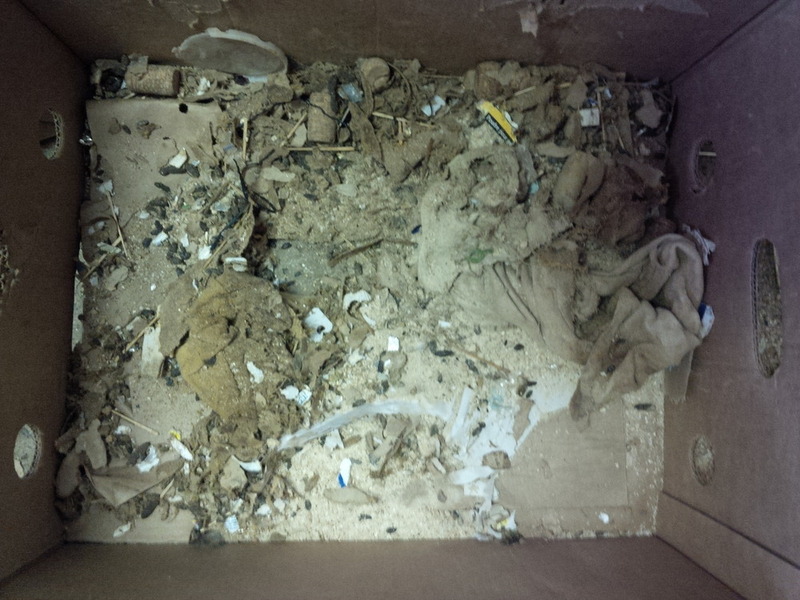 Knowing the rats and mice and voles and every other breeding vermin would be, well, breeding, I cleaned out all the boxes in my storage, washed and laundered everything, repacked everything into new boxes, and moved it all into my new house! I can't wait till I install the wood fireplace, the door, and the kitchen appliances! Once that's all done, I'm HOME! I realized the other day that I didn't actually believe that warmer weather was coming. I almost thought This is it. Winter has come and that's it. The heat of summer feels so far away, and almost forgettable. Living in negative temps has been exhausting, and it's amazing how much energy it takes just to stay warm, and how much more sleep I need just to recharge. I can't even imagine how people who live on the streets feel, with perhaps no end in sight, and hope a distant shadow. I thought I understood before, understanding hunger, fatigue, sickness, hopelessness. But I have a new understanding now--of cold, darkness, and the endlessness. I get the vacancy and the distractedness, the layers, the avoidance. Not to say I understand it all, or have experienced true homelessness, but I have a new openness and understanding. I was at a live music gig last night, which in itself separates me from being truly homeless, but I felt the irony, the separation, and some ignorance. I was jealous, a lot sad, and a little bit angry. You get to leave this building at the end of the night to go to a warm bed, a warm home, complete with all the appliances, amenities, and comforts, I thought. You with your obligatory drink-in-hand, clothes just so, probably not even cognizant of the honour and privilege of being able to go from one warm building to another--the amazing expectation that the majority of our population is warm, sheltered, and fed. It threw me back a decade, being told I may not walk again, and may be confined to a wheelchair for the rest of my life. As I fought to walk, fought for the privilege of independence and mobility, I gained an intense appreciation for that privilege. I gained empathy for the elderly, walkers and canes defiantly in hand, challenging ice and crosswalks and bad drivers. I suddenly understood that they could easily stay at home and submit to what was inevitably coming--what eventually comes for all of us--but they didn't. They spent however long it took to put on their coats, boots, gloves, and hats, get out the door, and make it to their desired destination. I got it--no weakness in sight, besides the slowing agility of the body and perhaps acuity of mind. In the same way, I've gained a consciousness around homelessness and displacement. There is a defiance in the sole act of existence, in continuing to strive for more, and for better, regardless of the realities of that existence. There is a courage in being able to hold one's head high, marching the streets knowing the right to the same air as everyone else. There is definitely a courage in facing visible judgment and discrimination, something I have experienced on the fringes, but never to its depths. It has become my experience that any existence in itself is a courage, a defiance of the inevitable. An acceptance of what is and how life has presented itself, and yet continuing in the face of these realities, is resilient, commendable, brave, and it is what makes us human. 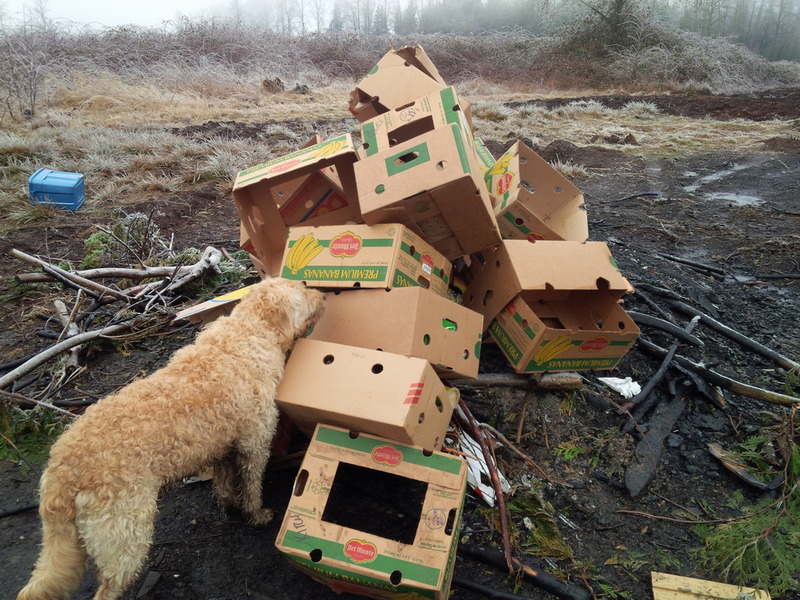 I am immensely grateful for what my experience has taught me, and even when my house is fully sealed, there's a lock on the door, and a fire in the hearth, I will continue to work with local community groups and organizations to address homelessness and hunger. Trim, trim, and more trim. It was pretty boring for me too, so I'll pretty much just leave it at that. 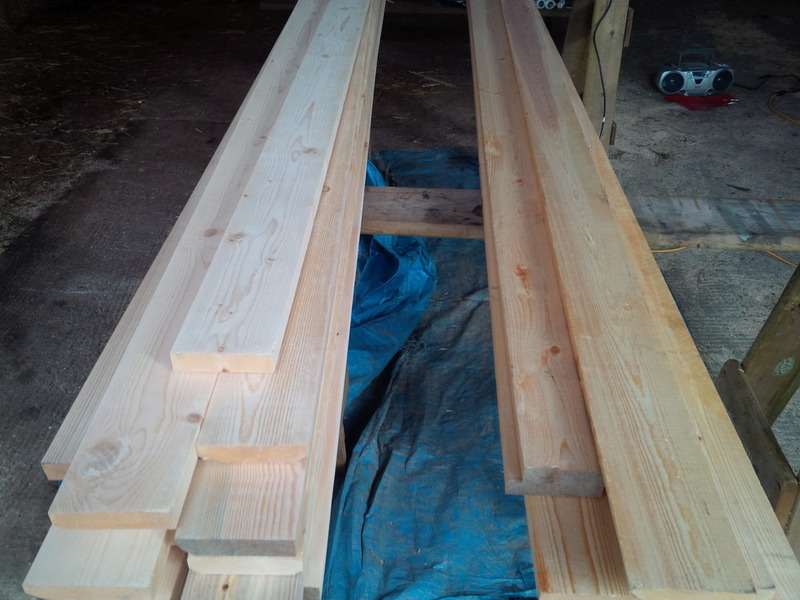 The 1x4 trim goes around the edges of the building itself, and the cedar trim goes around the windows once sanded and primed. Didn't get as far as I liked, considering I was in outside temps, the cedar was wet still, and life just sometimes happens! Yes. It's true. All 30 boxes of everything I own. Or owned, considering the massive burn pile. I thought I'd downsized, but I've downsized again, thanks to nature. Next time, I will be paying attention to the "Maybe-I-should-put-rat-traps-in" vibe. Putting my hand in rat piss was.... one of the more interesting experiences in my life. And I've had a few. Also seeing one of my soup bowls full of rat turds. Actually. Really. One full day of gritting my teeth and just doing it. PS. I Wikipedia'd hantavirus, and considering the very few cases in Canada and my invincibility to weird diseases, I think I'm good. But it took me a week to launder the fabrics and run all the dishes through a friend's dishwasher. That is all. Excuse the fisheye--I haven't run these pics through my editing program yet. I'm SO happy to have everything sealed up! 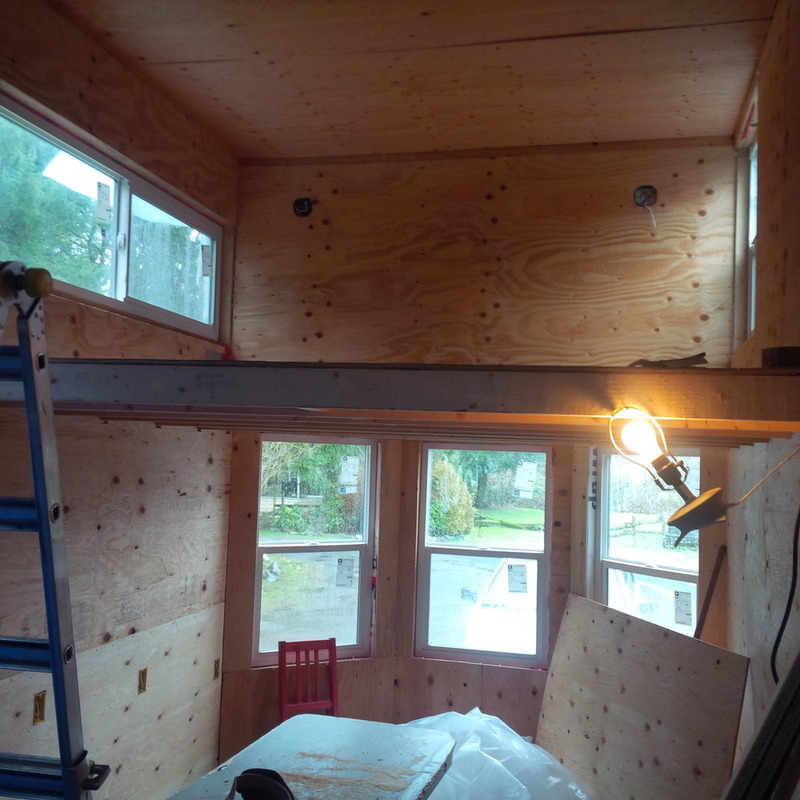 The far wall in the second pic will stay open until all the plumbing is done, and all the wiring is run from the external and internal water storage tanks and pumps. Next? 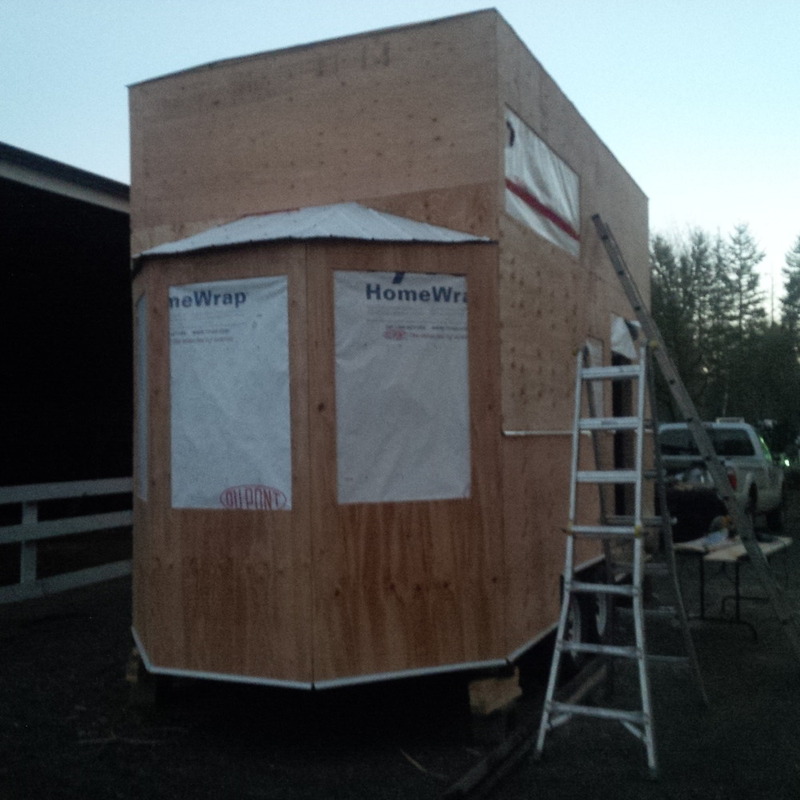 Install the door, seal up the windows, install the trim, then take the trailer off its blocks and bring it back to the weigh station to see where I'm at! And then? I MOVE IN! My season is soon starting, and I want to be moved in and comfortable before my 100-hour work weeks start again! - thinner than drywall--every millimeter counts! - it provides a solid wall while I figure out what other materials go where, from stone to glass to tile to wood--this space is going to look funky! Putting up the ceiling was interesting solo... once I started using nails to be the extra hands, it went much quicker! Many awesome tricks learned along the way on this one! I FOUND IT! Or, rather, it found me... one of those dastardly ads that I've learned to ignore that's been staring me in the face for, oh, a week? Check out this solar calculator. Enter your appliances and how often you use them, both AC and DC loads--AWESOME! 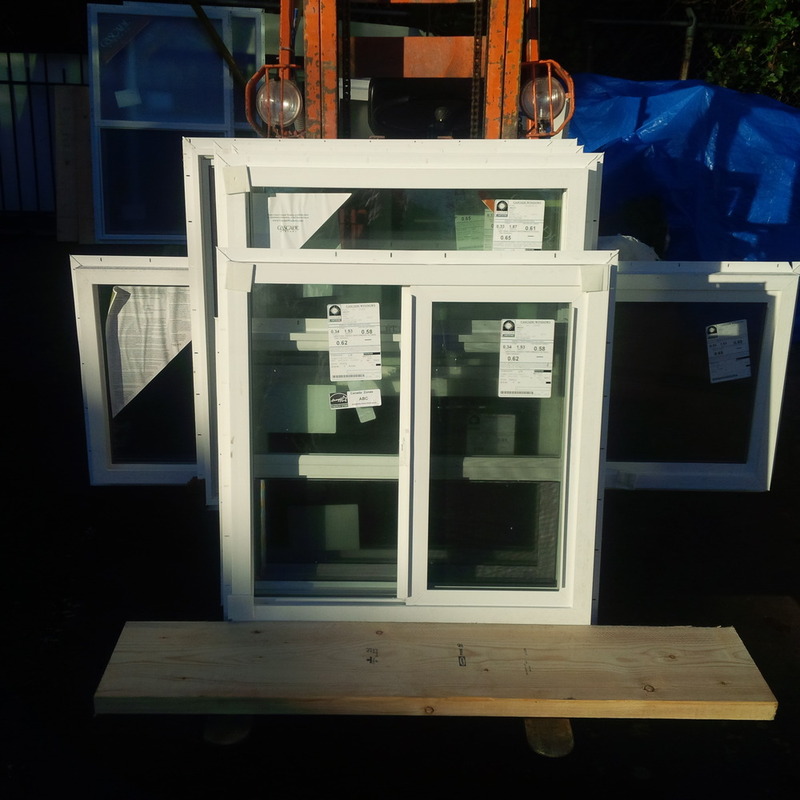 Day 13: Exterior Painting & Windows! While the primer dried, I put the windows in (Dad showed up unexpectedly again and helped me get it done within an hour--massive timesaver! ), then put the coat of red on the top two thirds and front. Red became my favourite colour years ago, and it's become an inspiring colour for me! 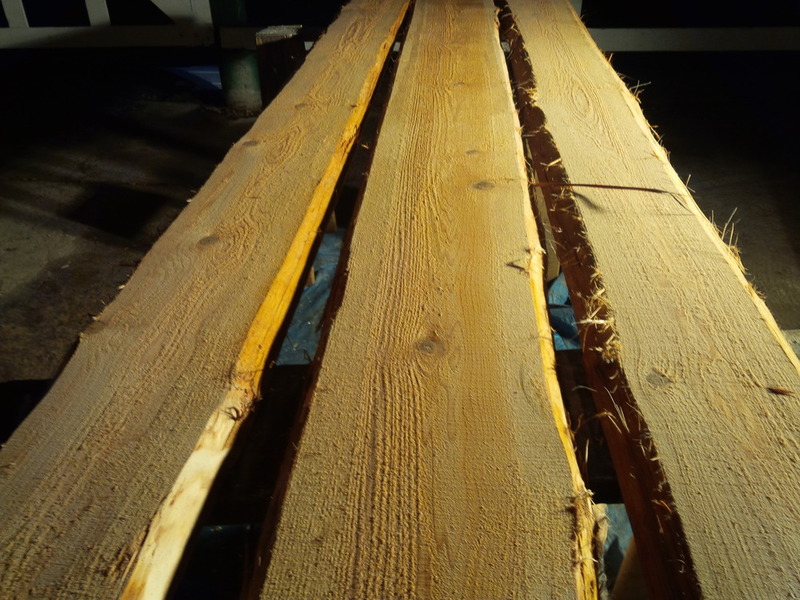 The bottom third will be clad with vertical cedar slabs recycled from a local log yard, separated with chinking. I'm hoping to get the door on soon as well as the trim so I can move in! I've asked BC Hydro and Fortis BC how much power supply I'll need for my little house, but no one can tell me anything, besides "Go to the online calculators". So, I've been to six online calculators (this is a really good one), but Question 1 is always, "How much power do you use now?" My answer is zero, nada, and zilch, and it's not a good one. Apparently, I'm supposed to have a Hydro bill, and I'm supposed to pay for electricity? Have I mentioned I've been living on battery LEDs, flashlights, and candles for the past eight months? So, because I cannot answer Question 1, I cannot figure out how much power I need, and the online calculators are useless. I've asked electricians and other people who deal with Watts and amperage and voltage, and none of them can tell me anything! 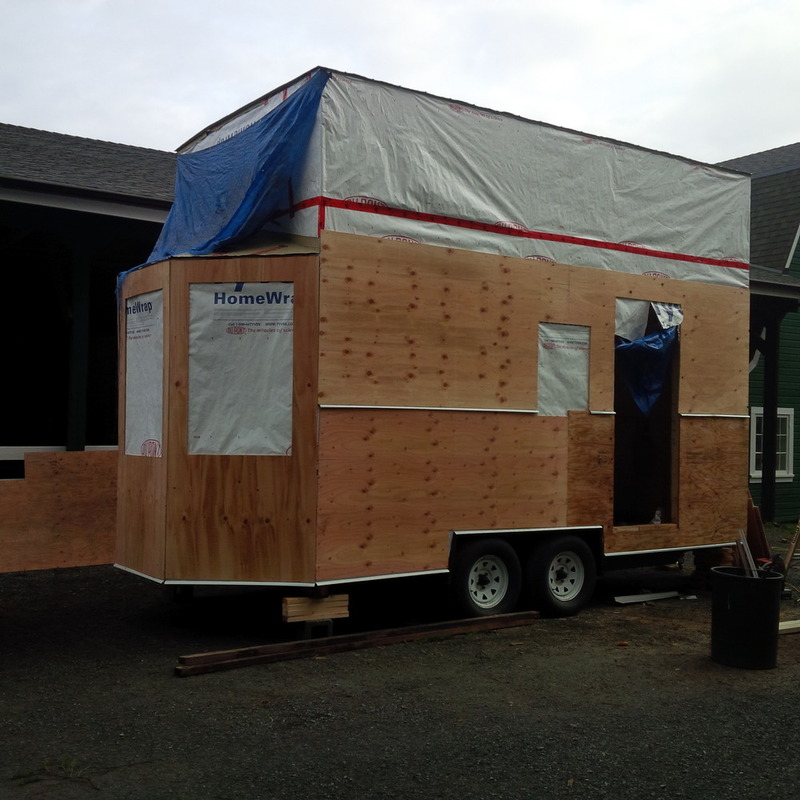 The most helpful person has been Eric, at Fraserway RV, who figures 200-300 Watts would be sufficient. Easy peasy. Next problem: I've been to three expos lately, and whereas last year, they had solar exhibitors, they do not have any solar exhibitors this year! This mirrors my problem a couple weeks ago, when I went to the boat show to buy a cast iron stove, and the ONE boat company who supplies cast iron wood stoves wasn't an exhibitor at the show, so I am still stove-less! This adventure is to be continued! 34? Not really. But it's up in the top 50 FAQ for sure! I don't have anything against RVs, nor do I have anything against the government or the powers that be. I'm not a "screw this grid, I'm off it!" person. I'm also not a pothead, a junkie, a rebel, or a hater! What I do have is a desire to have my life work for me, so I can do what I was born to do, what I've lived to do, and have it work in a way that's a little bit different. What started as a dream when I was 8 or 9--to live in a small space on some land to live a simple life while changing the world--has become this project! Building custom is part of my every day life--in business, in art, in everyday things like my schedule, my clothes, my way of life. - This house is custom designed to fit me. I'm 6'2". The counters will be higher, the shower head will be higher. Ever tried to fit into something too short for you? - The loft is just high enough for me to kneel upright without hitting my head, and without compromising head space below the loft. 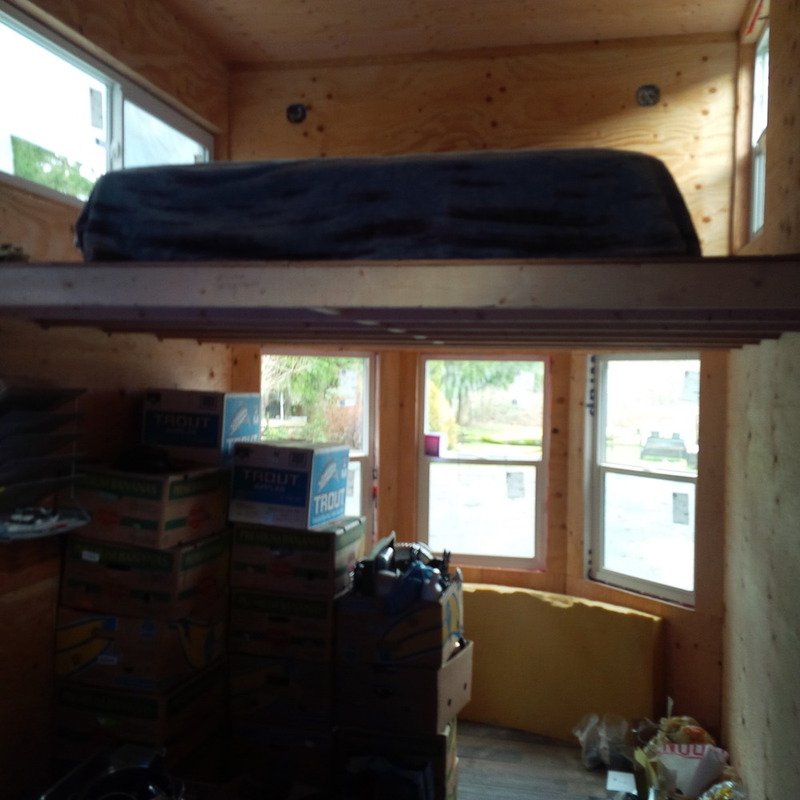 A) What RV has a loft?! and B) Some people are good with squeezing into their sleeping bunk--I need to be able to breathe! 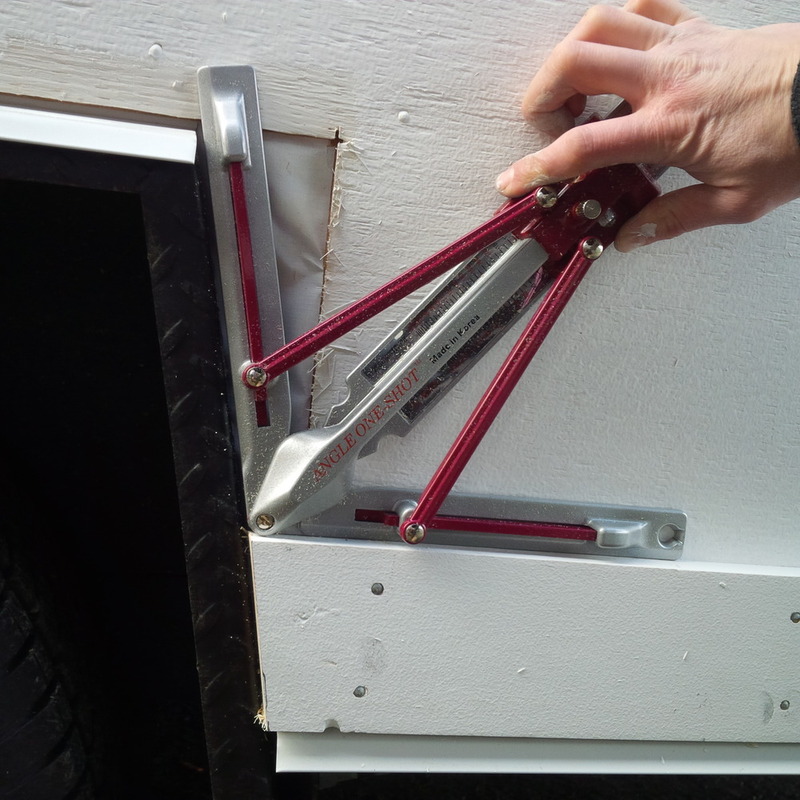 - RVs are designed for summer use... this trailer is insulated well enough to go through Canadian winters comfortably! - What RV has a wood fireplace? 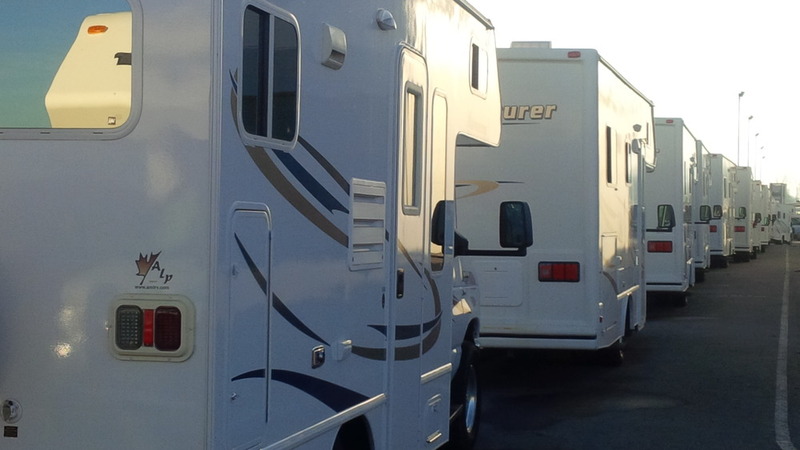 - RVs are designed for recreational use: there is a lot of hang out space, but not a lot of living space. 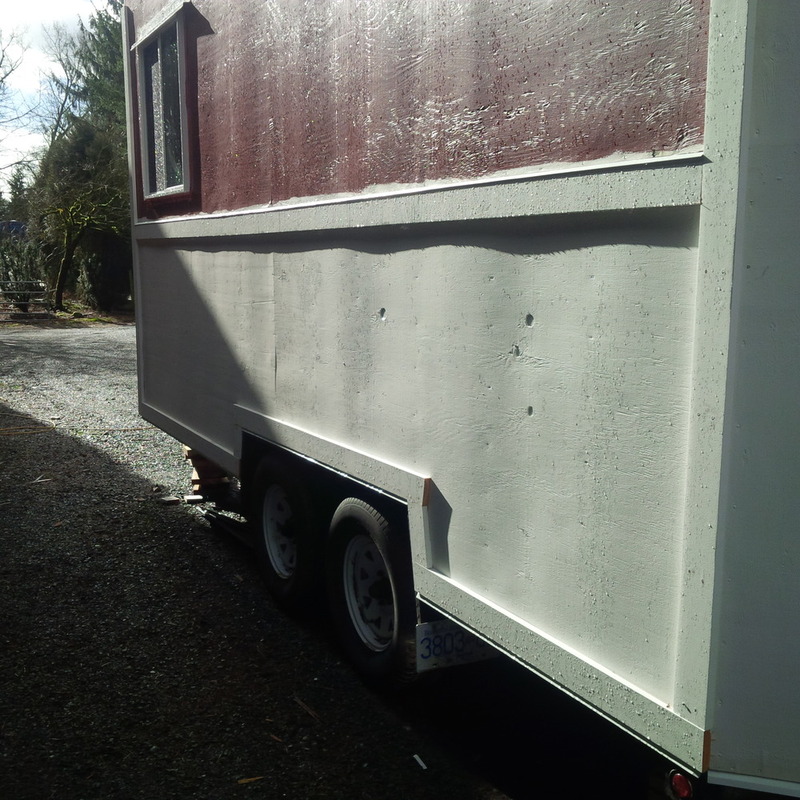 This trailer has max counter and storage space--space for winter, summer, and all the seasons of life. Minimal counter space can only last me so long before I start going crazy! - Custom designed by me, for me... while I could put art on any RV wall, building my own home means my wall is art! - Cheaper, stronger, more leak-proof, and WAY more awesome! - No particle board. Everything is solid quality, and I've recycled and upcycled everywhere I could! - Live? In an RV? I live in the different, the uncommon, the unconventional. I never wanted to live in a trailer, never thought I would, but it's an awesome an interesting solution to the cost of living and being able to travel, change the world, and have some fun without worrying about a crazy mortgage and a mountain of debt! 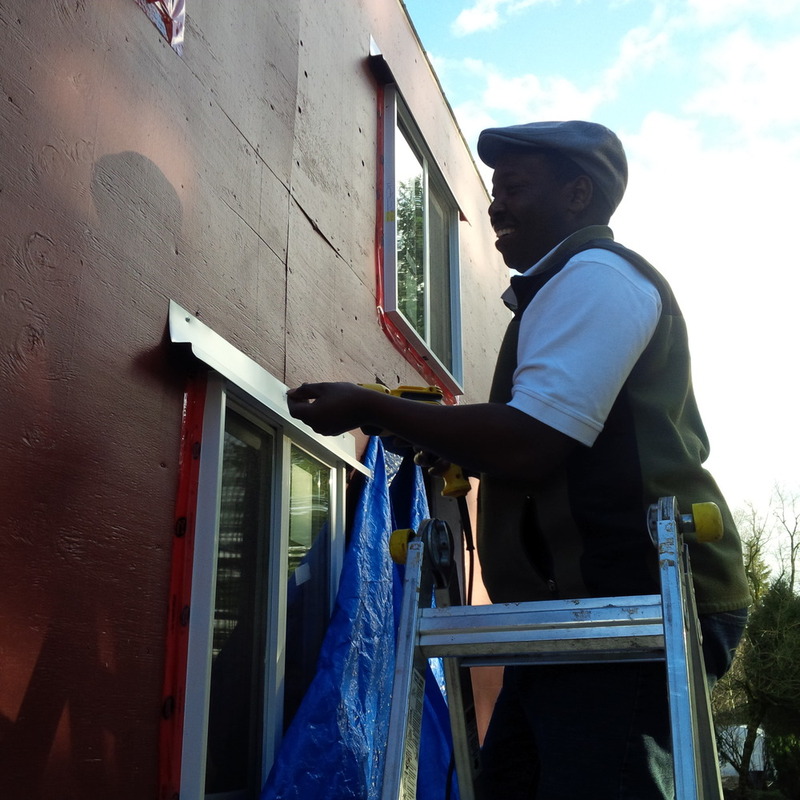 John Zivkovic came by and helped me put the top row of exterior cladding on the house--tall help! So thankful for all the people who've come and lent me a hand! 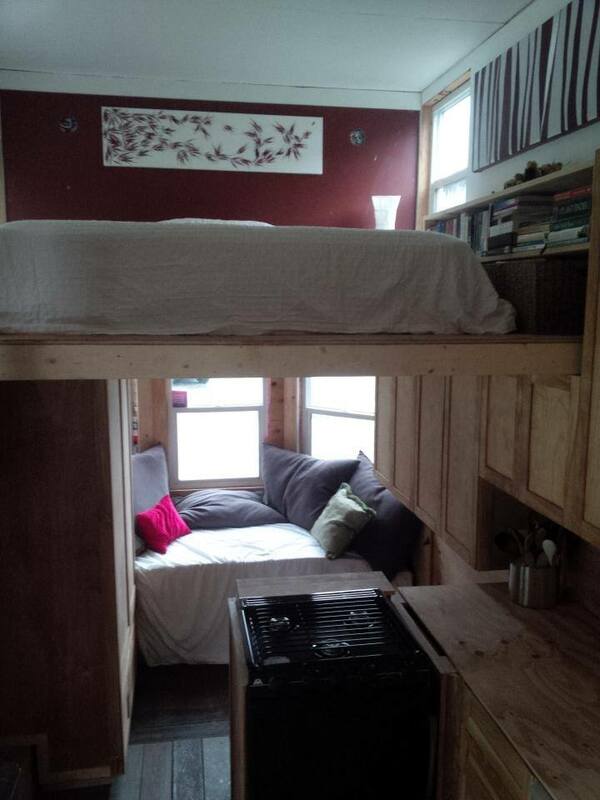 Loft from left to just before door, fireplace at the window below, shower to right of door. 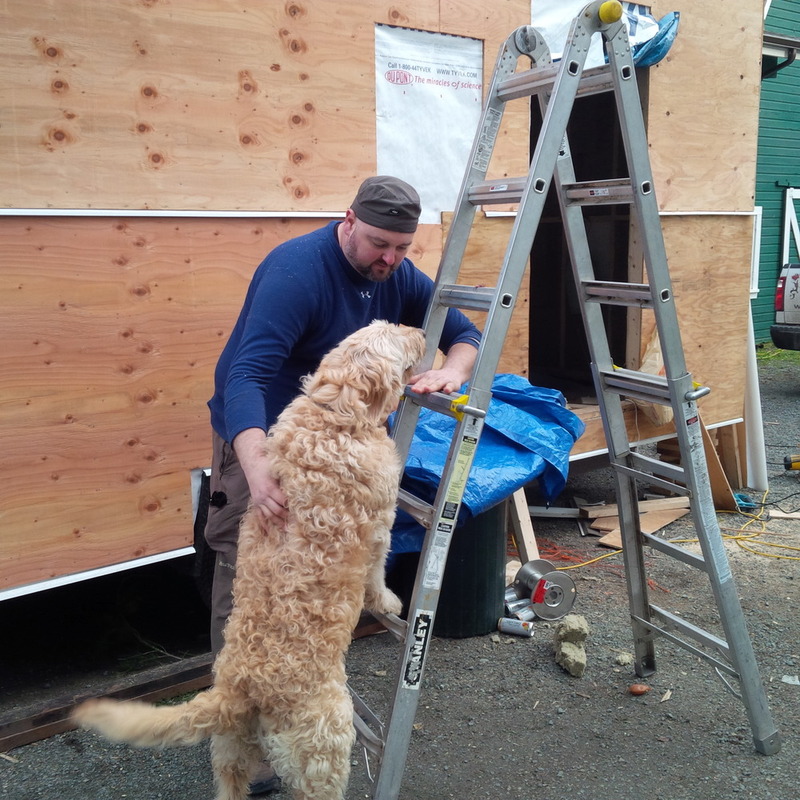 John teaching Scotch how to climb ladders, with beef jerky as incentives! The bay roof took me forever! 6 pieces of steel, as I didn't want to go buy a whole new sheet of steel. Kitchen at first two windows, shower on far left, loft at far right to before kitchen windows. - No fiberglass sticking into every pore: no gloves needed! 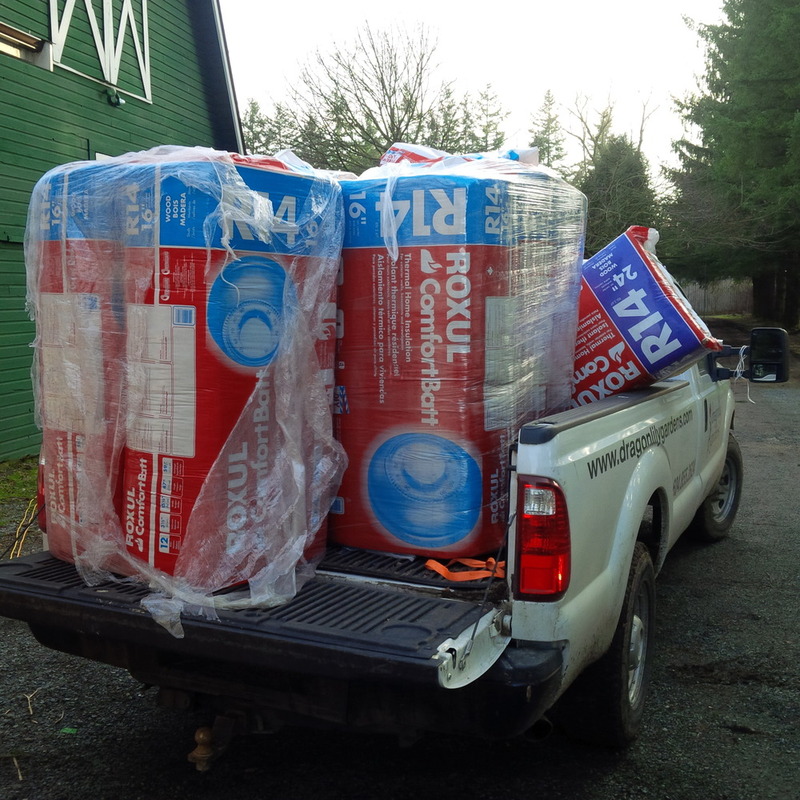 - Check out Roxul's Environmental Policy. I like it! One con: 5-10% more expensive. Worth it! 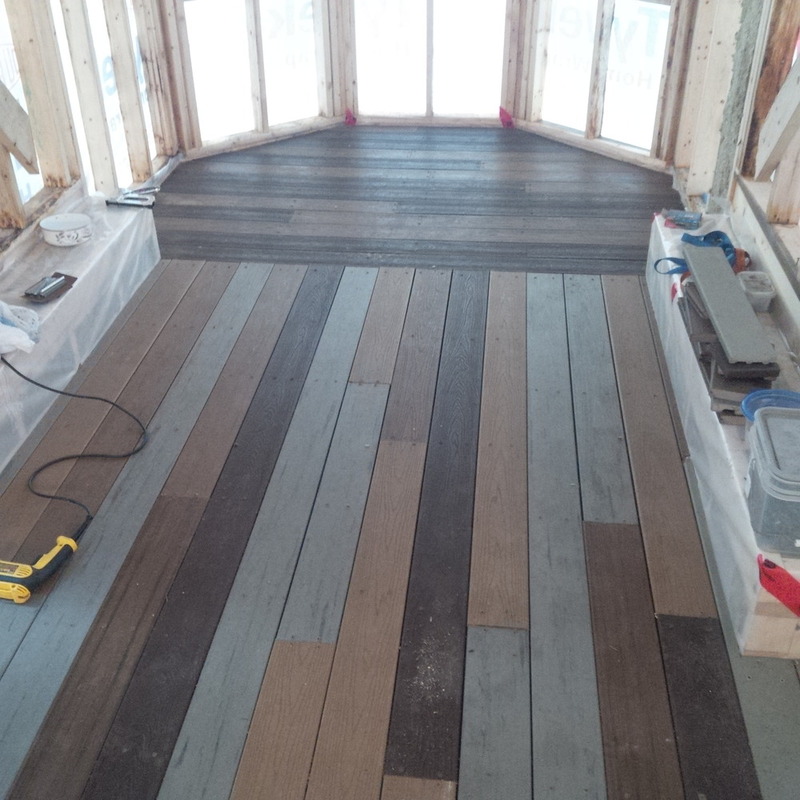 Feels like the nailing never ends..... used 8lbs of nails on the exterior ply while the electrician started, then moved to insulating the walls. 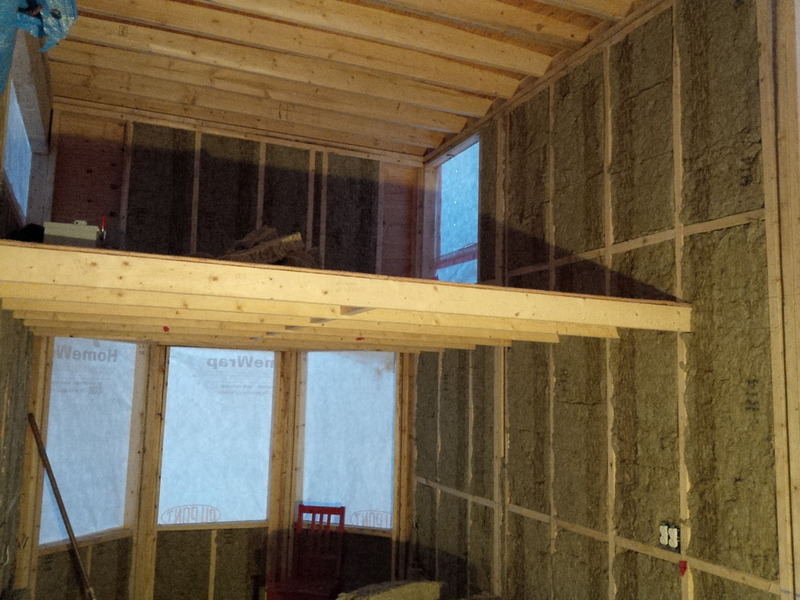 The insulation was by far the fastest task of everything so far--three hours to do all the walls! I love working with Roxul--incredibly easy to cut and place, and all without skin protection! Installed a few pieces of plywood and the bottom drip flashing--the plywood is tough going solo! Then Alicia Kenyon Champ came over and helped me get all of it except the top few pieces! Many thanks to Alicia for lending a much appreciated hand! Why drip flashing? 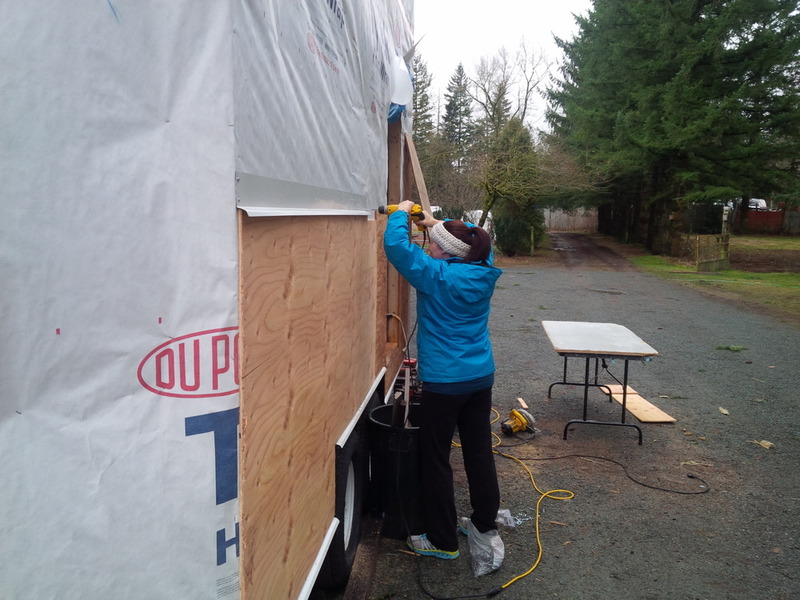 I chose it to protect the plywood, guide water away from the undercarriage, and break up the solid block of siding. 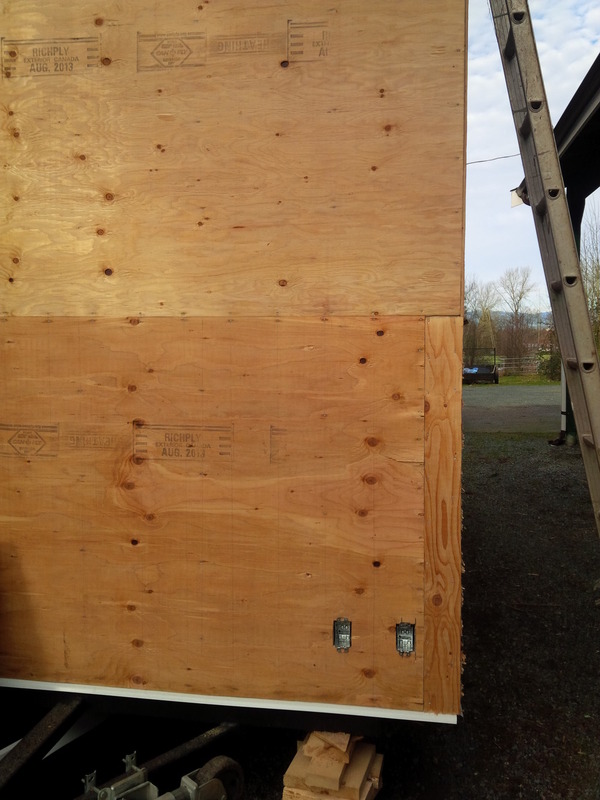 Why plywood over the Tyvek? I needed to save as much horizontal space as possible, but needed siding. 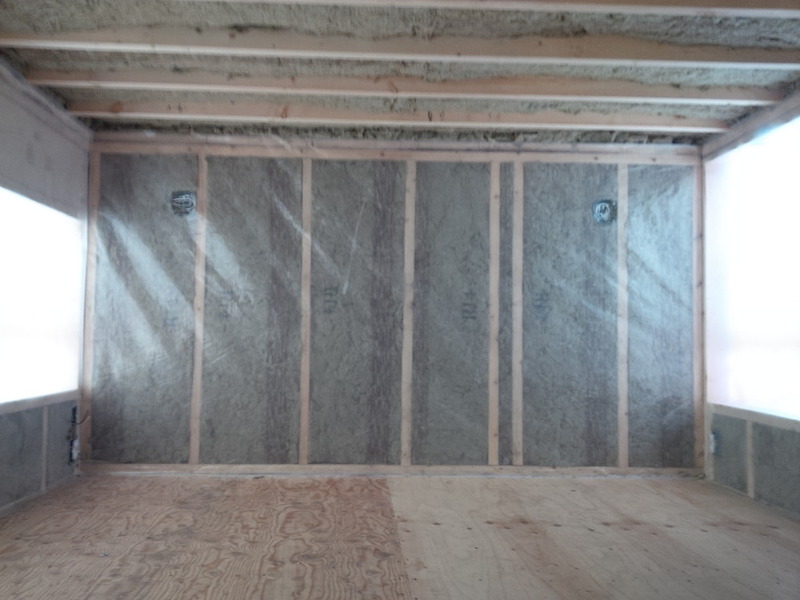 If I did this again, I'd use treated plywood, or leave the ply under the Tyvek and do siding with one type of material rather than the various types I have in mind. 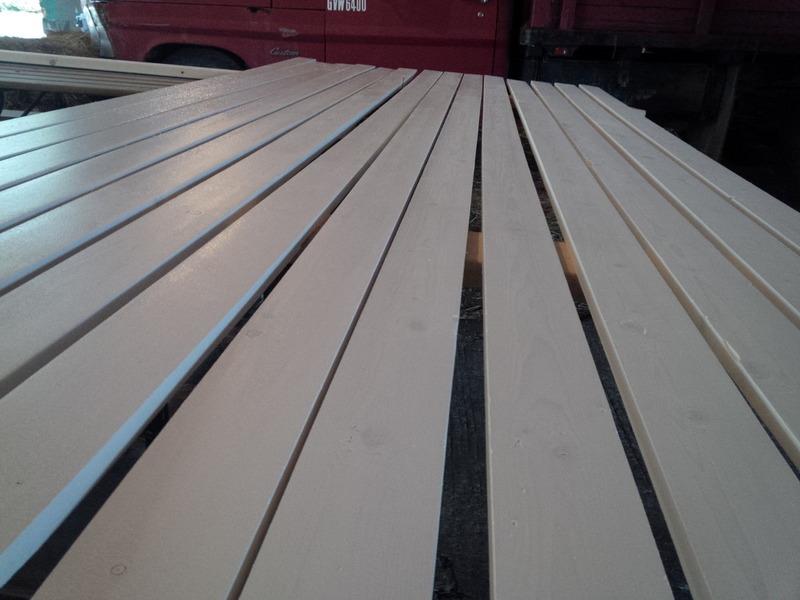 Treated plywood takes a year to cure, and it would be that long till I could paint it... I also don't like the chemicals in the treated ply, so this is still on my ideas board for sure! 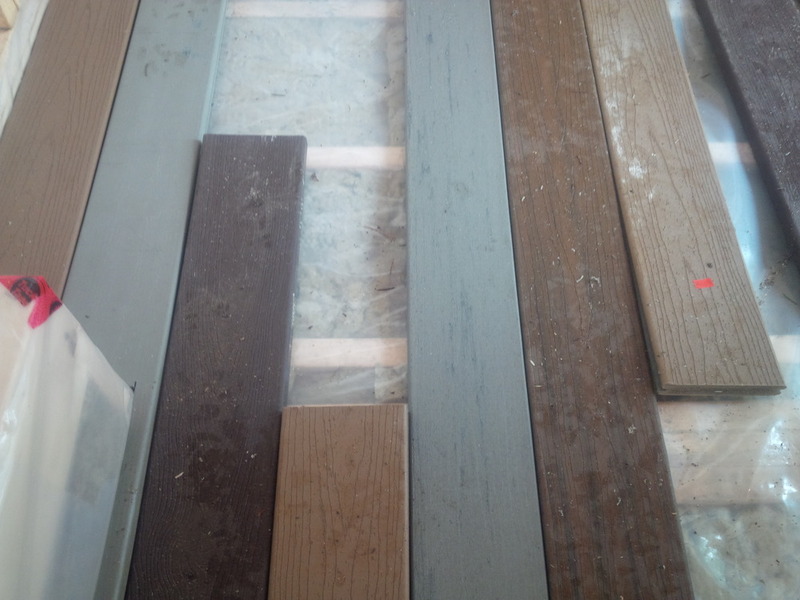 I had two colours of composite decking that I got for free (about 50 square feet--see previous post), and did the cantilevered bay window area with those two colours, then went to Habitat for Humanity and got another 20 square feet for a really good deal (read: colour three), then bought two more colours at Home Hardware, for a total of five colours. 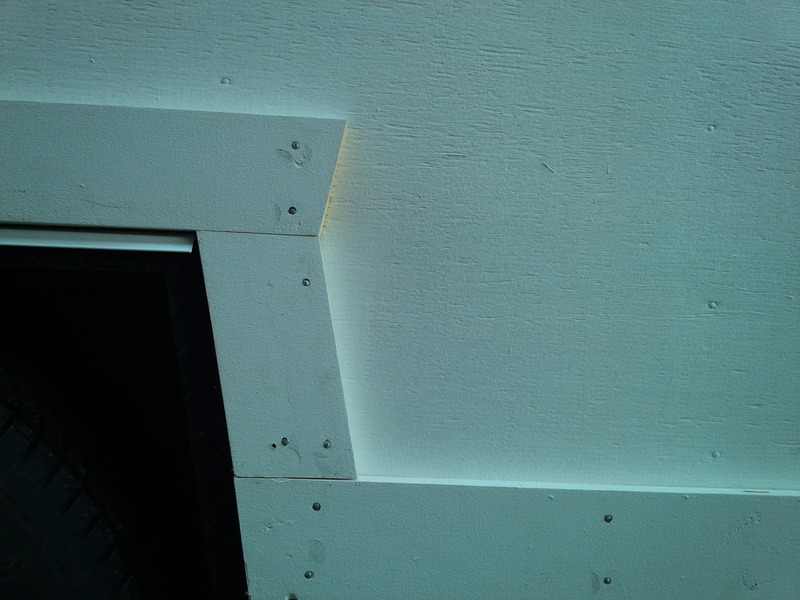 Each piece was pre-drilled to fit the 12-inch joists underneath, then screwed into place. I placed everything randomly except for two pieces (the longer super dark ones) as if I chose a design, I would be continually deconstructing it forever into infinity. I thought the perpendicular directions might look funny, but I love how it delineates the two areas, and I love that the bay window area is darker than the area in the foreground, further differentiating the areas. And... just so happens that the centre board is centre of the house, which satisfies my eyeballs! I love that my floor has a story! I also love that it will last forever, and can handle dirty shoes and feet!